woohoo for new vampire weekend! Ok, this isn't a song posting but this is way too cool. Using my new procrastination tool StumbleUpon (check it out if you don't know what it is...), I came across across this artist's Flickr page. 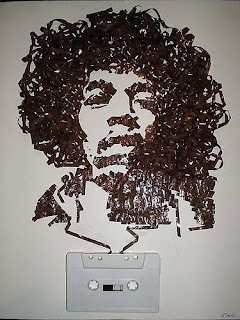 Iri5 is creating a series of portraits of mostly musicians using cassette tapes called "Ghost in the Machine." Pretty freaking cool if you ask me. Check out their Flickr profile here.